Happy Birthday Mom, Grandma, Aunt Ann, good friend! Ann Stagg Woodbury would have been 96 today. Her biggest legacy was her five children, 8 grandchildren, 12 great grandchildren, numerous nieces and nephews. More than just us: Mom helped Dad, Howard, in his Woodbury Real Estate business and Wyckoff Fire Department in Wyckoff, NJ. 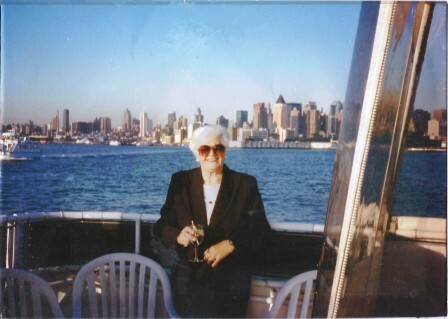 She loved going on dates (they were married 60+ years) – vacations, football games, dancing to Frank Sinatra, firemen conventions, parties, playing cards, entertaining. Her solitary passions: crossword puzzles, knitting, gardening, reading, writing ditties and poems. Her culinary favorites: Dewar’s on the rocks, or a smooth Manhattan, a hot dog with the works from Clixie’s, a hot fudge sundae with nuts, and a once-in-a-while cold beer with soft shell crabs. She was known for: Always being dressed like the lady she was; her ready smile, her helping hand, her wry sense of humor, her mischievous playful side, her high expectations and standards for herself and her children. She taught us: to get along, to respect one another, to be there for each other in good times and bad, to love, laugh and enjoy life. We all have learned much from her. What’s your favorite memory of Ann Woodbury?